Meritorious Bangladeshi nationals who want to undertake engineering, graduate, post-graduate and PhD / post-doctoral course. 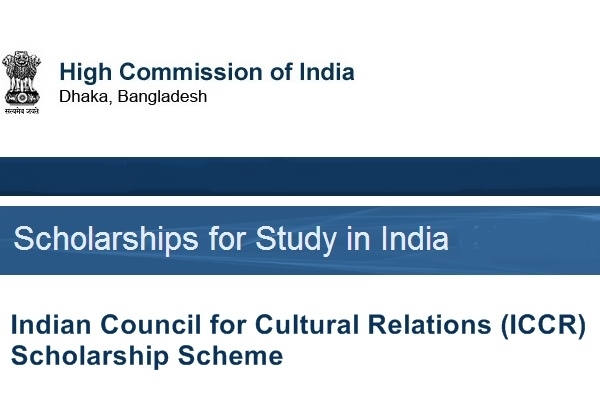 Indian High Commission, Bangladesh provides Indian Council for Cultural Relations (ICCR) Scholarship Scheme in India. ICCR Bangladesh Scholarship Scheme is open to Bangladeshi nationals to pursue various courses in India at the Under Graduate, Post Graduate and PhD level, except in Medicine. The aim of the scholarship is to support meritorious Bangladeshi nationals who want to undertake engineering, graduate, post-graduate and PhD / post-doctoral course. The Indian Council for Cultural Relations (ICCR), is an autonomous organisation of the Government of India, involved in India’s external cultural relations, through cultural exchange with other countries and their peoples. It was founded by Maulana Abul Kalam Azad, the first Education Minister of independent India. Scholarship is available for engineering, graduate, post-graduate and PhD / post-doctoral programme. Applicants must have a BE / B Tech degree or must apply for the course, in their school-college syllabus must include Physics, Mathematics and Chemistry. Candidates must be proficient in English and have at least 60 percent marks in the passed examination or GPA 3 out of GPA 5 in the qualifying examination. Candidates will have to take part in 30-minute English proficiency test, whose time and place will be announced. All students will have to stay in the hostels. No exception for family/ health reasons to stay outside is entertained.. Candidates can apply online. TICCR has developed a portal exclusively for the benefit of the aspiring students who may log on URLhttps://a2ascholarships.iccr.gov.in and create individual login ID and password before submitting the applications online.